Mallard ducks have a wide range of habitats including lakes, marshes, streams, rivers, and ponds. This animal is found in North America, South America, Central America, Europe, North Africa, Asia, Australia, and New Zealand; in fact it is the most common wild duck in the Northern Hemisphere. They are a common animal found in deciduous forests. Below we have listed information which both kids and adults should find interesting about how mallards look and how they have adapted for survival. Click here for a great selection of Amazon.com books about Mallard Ducks. The scientific name for this species is Anas platyrhynchos. The females of the species are very plain looking in comparison to the males. Where the females are mainly brown the males (drakes) have a shiny green head a white ring around their necks along with grey feathers on their wings and belly. Mallards are omnivores (eat both plants and animals). They mostly feed on the surface of the water with a diet consisting of all kinds of seeds, small fish, insects, frogs, and fish eggs. The average weight of these animals is 1 to 2.5 pounds (410 to 1,000 grams). The average length of these ducks is 16 to 22 inches (43 to 56 centimeters). This animals webbed feet enable it to paddle quickly through the water. This animals bill is well adapted for filtering out debris it scoops up from the muddy water of lakes and ponds. Most Mallard ducks spend a majority of their day in the water. Twice a year, mallard ducks shed the feathers they use for flying. Until the feathers grow back, which takes a few weeks, they cannot fly. The female mallard ducks make the familiar duck quacking sound where as the males make a rasping sound for their calls. Ducks have many predators. Birds and large fish attack ducklings (baby ducks). Their nests are raided by foxes and large birds such as eagles and hawks. Adult ducks are fast fliers which help them escape from predators. A mother duck will usually lay 10 or so eggs. She tends to the eggs by herself in a nest lined with warm down she has plucked from her body. Shortly after ducklings hatch the mother duck will lead them to the water. From that point on they usually do not return to the nest. After around 2 months, the ducklings can fly and become independent. 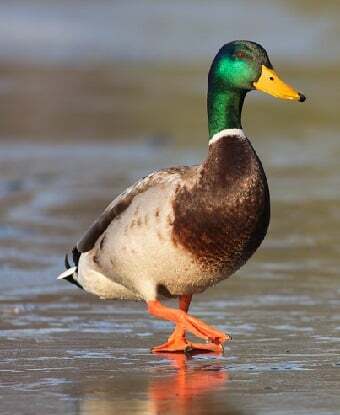 The Mallards well known waddle is due to the fact that it has legs set far back on its body. The outer feathers of this duck are waterproof due to oil secreted from a gland near the tail. Under the waterproof feathers are softer feathers called down. Mallard ducks escape the cold winters of the north by flying south during this season. They fly in flocks and often to the same spot year after year. They rely on landforms such as coast lines and valleys to guide them. A group of baby ducks is called a brood. Due to its beautiful feathers the mallard duck is one of the most popular ducks for bird watchers and hunters. A fun fact about the Mallard is that sometimes a baby duck will ride on its mothers back as she swims through the water.